Description for Beach Front 4 Bedroom House plus 2 Bedroom Apartment - AMAZING! Amazing opportunity to be directly on a gorgeous pristine beach! 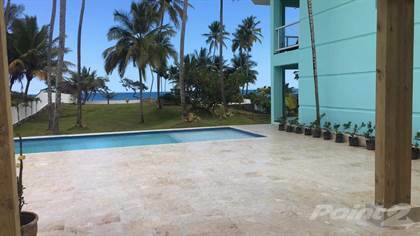 \r\rLocated only 18km from central Cabarete this 4 bed, 4.5 bath home is being sold fully furnished. Upgraded finishes, mahogany, granite, natural stone throughout. \r\rA 2 bedroom condo is located above the 2 car garage - also being sold fully furnished. Located in a gated area of two homes.\r\rThis villa does not have a swimming pool but one can be installed there is ample space.\r\rContact me if you've been looking for your very own dream home on the beach!! Features for Beach Front 4 Bedroom House plus 2 Bedroom Apartment - AMAZING! Hi, I'd like to find out more information about Beach Front 4 Bedroom House plus 2 Bedroom Apartment - AMAZING!. Thanks so much!